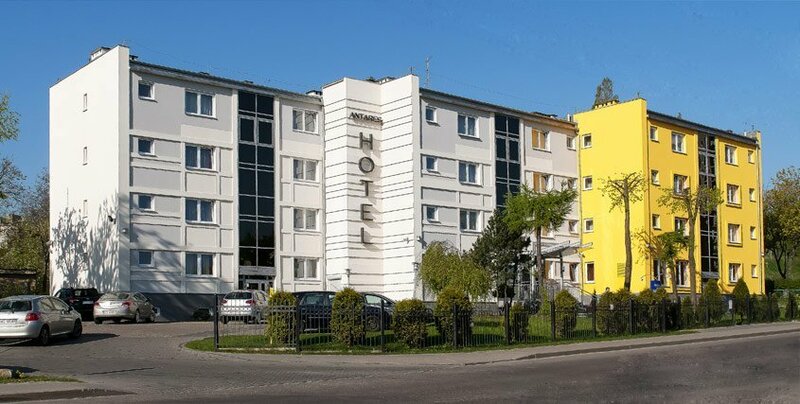 Our hotel is situated in Gdynia at Komandorska 59 street, a short distance from the city center, the Tri-City bypass (road) of and adjacent to the ferry terminal. The hotel is located in quiet surroundings which provide comfortable conditions for rest and relaxation. Convenient public transportation makes it possible to reach the city centre in 4 minutes. It is about 300 meters to the Tri-city train station that connects Gdańsk - Sopot - Gdynia. From Gdańsk: Head towards Sopot, Gdynia, Szczecin, along Grunwaldzka in Gdańsk, Al. Niepodleglości in Sopot and Al. Zwycięstwa in Gdynia. In Gdynia head towards Szczecin and Morska street. Passing the main train station, Gdynia Główna, on the right hand side, head straight through Morska Street. At the second street light next to kaufland supermarket turn left next into Mireckiego Street and then right into the Komandorka street. The hotel is 300 meters ahead. From Gdańsk (Łódź): Use the ring road, heading for the Kwiatkowski flyover. Take the exit from the flyover leading to Gdynia Oksywie, Gdynia Obłuże and the Port. Head towards the city centre. At the traffic lights turn right into Morska Street. Head straight for about 200 metres and at the traffic lights next to the Lidl supermarket, turn right. To drive from the Kwiatkowski flyover to the hotel takes only 5 minutes. Arriving from Wejherowo: From the main street heading towards Gdańsk head straight and pass under Kwiatkowski street turning right after 200 meters next to lidl supermarket, turn right. At Gdynia Główna you have to change terminals for internal trains (SKM) and pick up the train heading towards Gdynia Chylonia (or Wejherowo). Get off the train at the 2nd stop called Gdynia Grabówek. From there it is a 7 minutes walk to our hotel. It is also possible to catch the bus or electric bus at Gdynia Główna. The final bus stop is located 100 meters from the hotel. Buses: 105, 109, 125, 141, 710, 750, 759, 770 (5 stops). Electric buses: 20,22, 25, 26, 27, 28, 30(5 stops).